The Fisher Scientific Microplate Shaker offers you consistent, digitally controlled agitation with variable speed for 2 microplates. This lab shaker moves horizontally with a 1” orbit and has a variable speed between 150-1000 rpm. This plate shaker also has a also has a timer feature that runs between 1 and 24 hours and will shut the instrument off automatically at the end. This lab shaker is ideal for applications in life sciences such as immunoassay, for shaking ELISA plates, and also for the food industry for determining vitamins in milk and other applications. This compact shaking mixer has a 5 x 7 inch platform that holds two plates side by side and can be used in cold rooms or incubators with an operating temperature between 4 and 40°C. This platform shaker can also be upgraded to a 4 plate shaker with an accessory available from Fisher. 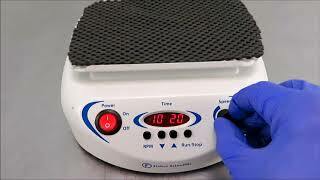 This Fisher Scientific Microplate Shaker has been fully inspected and is operating to expectations. All of our lab equipment comes backed with our standard warranty. Shoud you have any questions, please don't hesitate to contact us.